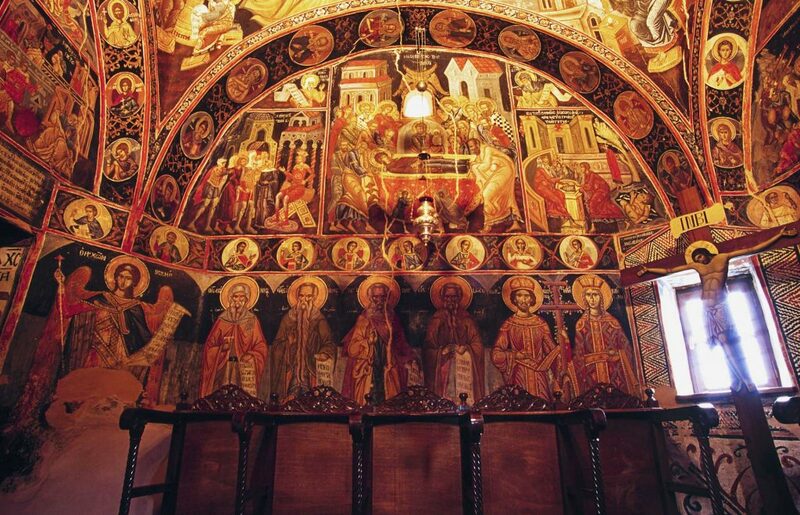 The Byzantine temple of Dormition of the Mother of God is the most important monument of Kalabaka. 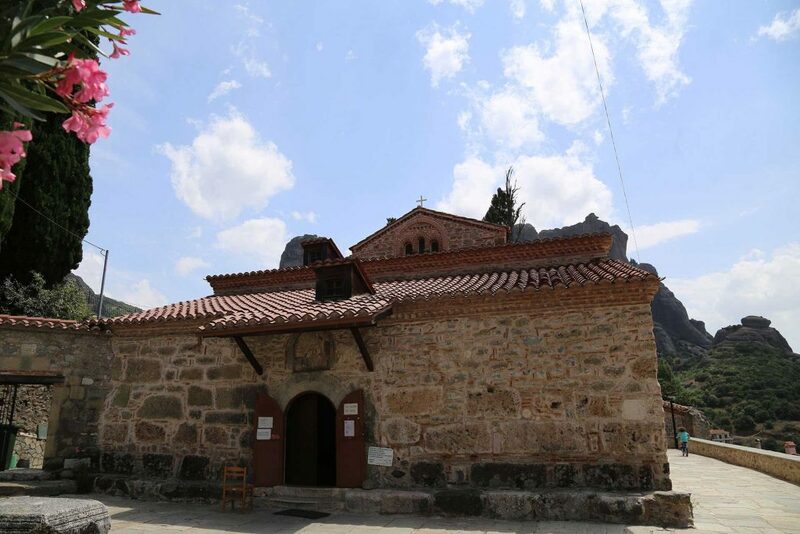 The temple of Dormition of the Mother of God that is located in the old city was erected between 10th and 11th century on the ruins of an early Christian royal. It’s in the rhythm of an aisled Basilica mixed type, it has banking and enlightened the intermediate declinable splint and the tribelon. 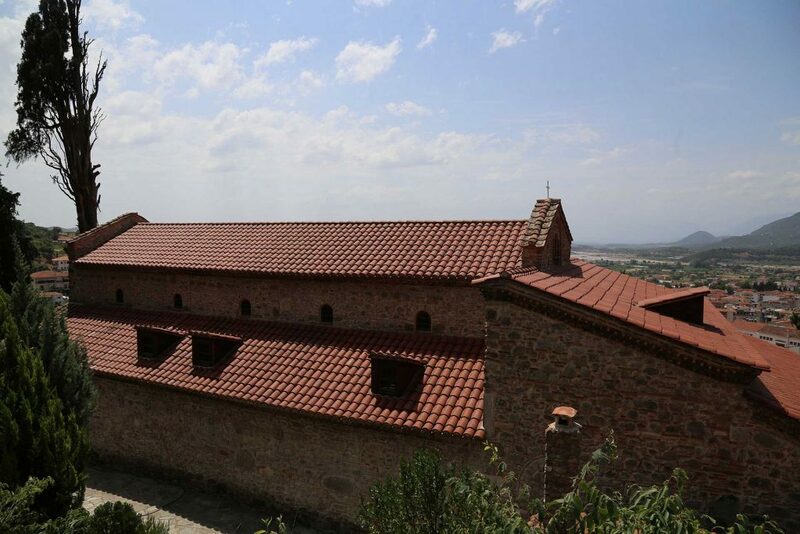 The exonarthex was added in 16th century. In the southern wall a lot of ancient departments of bas-reliefs (rosettes, embossed representations, signs, capes etc) were fitted externally, as well as an early Christian sculpture with tropical climbing vine. 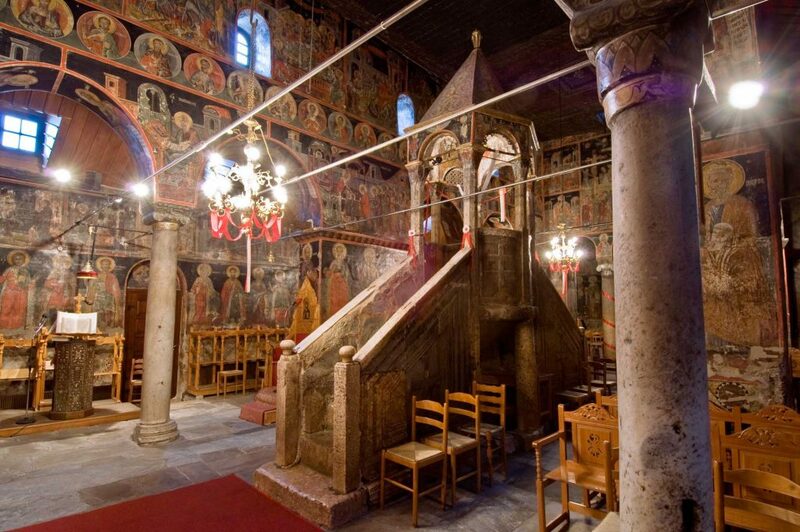 From the sculptural décor of the Byzantine Basilica the oldest part is the marble ciborium of Altar stone that is found in the Holy Step. The unique in Greece, marble Pulpit is situated in the centre of the intermediate declinable, in front of the Beautiful Gate. It was reconstructed from architectural parts of the old Pulpit. 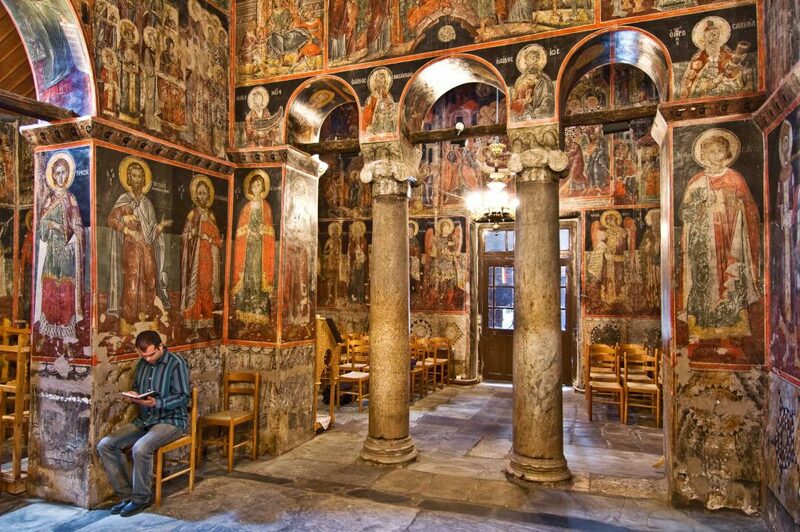 The murals of the temple are dated from 12th until the 16th century and present exceptional interest. 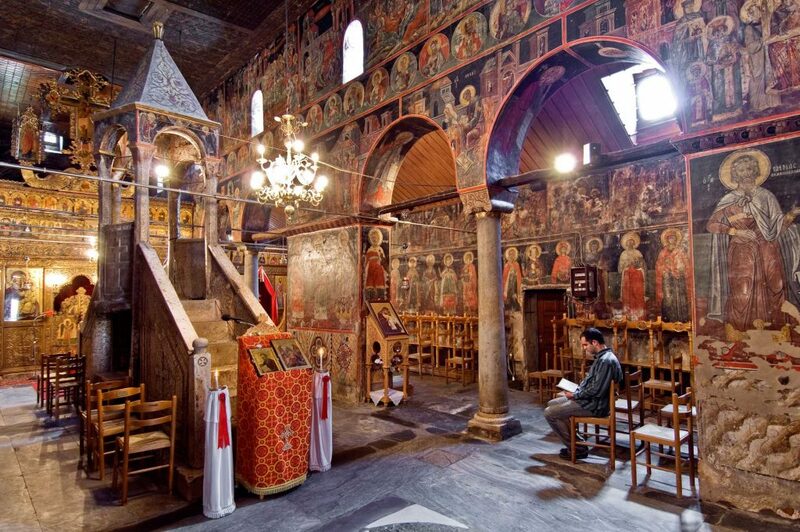 Several murals were made in 1573 from the priest Kyriazis and Neofytos, son of the eminent painter Theofanis of Kritos. From the portable pictures of the temple, the most important is the two-sided picture, which on one side the Dormition of the Mother of God is portrayed and on the other side the Crucifixion of Christ. 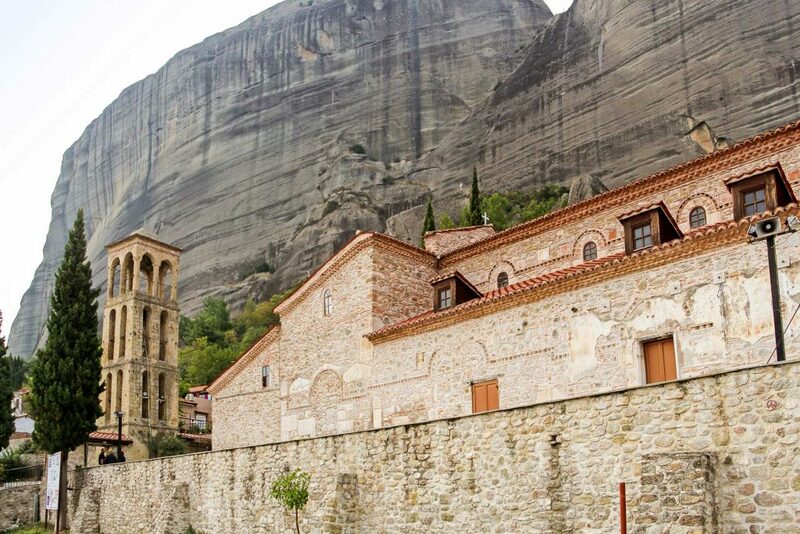 Nowadays, the two separated pictures after the robbery and re-establishment are presently in the abbey Barlaam of Meteora. The carved in wood chancel screen of temple belongs to the appreciable work of post Byzantine woodcarving and has been manufactured probably during the 17th century. In very small depth in front of the left winger part of the main temple a part of the mosaic flooring has been revealed. While entering the temple, on the northern wall of the Narthex, the golden bull of emperor Andronicus III’ Palaiologos 1336 is written with capital letters, with which the limits of the Bishopric Stagon and granted privileges are determined, as well as the sigillium of the ecumenical patriarch Antony IV’ 1393, with which are renewed the privileges of the bishopric Stagon are renewed. 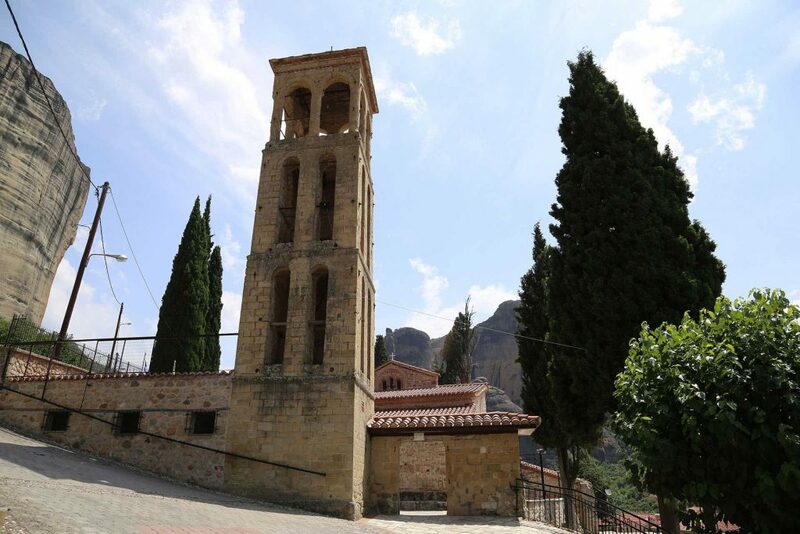 Impressive and appreciable is also the bell tower of the temple that is located in the northern side of the entry of the compound of the temple. Of particular interest is the only kind of marble pulpit with two staircases, lying on the floor in the center of the nave of the church. Reassembled, in part, from a material of early Christian pulpit.